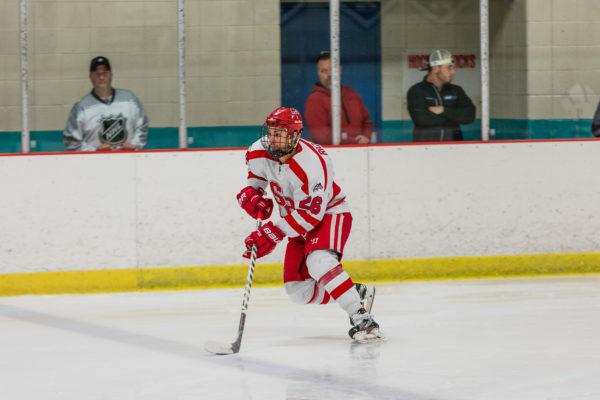 The Stony Brook hockey team flipped the script on the Ohio University Bobcats Saturday night at Bird Arena in Athens, Ohio when the team won 3-2 in its second consecutive overtime game. Seawolves junior forward Brad Riccardi tipped home the game-winning goal on a delayed penalty call just 15 seconds into the extra frame. The goal was Riccardi’s second of the game and put him in a three-way tie for the team lead in points. The win followed Stony Brook’s first loss of the campaign, which came at the hands of Ohio University on Friday night in 3-on-3 overtime. Although the Bobcats’ momentum carried over at first, Stony Brook found a way to right the ship and get back to its game. Yoder had an impressive weekend between the pipes, turning aside 67 of the 74 pucks that came his way. The goalie played all 120:59 for the Seawolves and improved his record to 4-0-1 in the campaign. This was the first time Yoder played on back-to-back nights since March 12, 2017 when the Seawolves were knocked out of the American Collegiate Hockey Association’s national tournament by the Bobcats. Saturday’s win was his first against the club from Ohio University and could mark a turning point in his career, as Yoder posted a 1.97 goals against average compared to 3.97 in his previous appearances. The Seawolves’ first goal of the night came from freshman forward Joseph Slevin to tie the game up at one 4:43 into the second period. After a relatively slow start, Slevin found the back of the net three times in the past four games and has earned eight points in that same span. His 10 points on the season tie him with Riccardi and sophomore forward Kevin Murphy for the team lead. Bobcats sophomore forward Gianni Evangelisti scored halfway through the third to regain the lead, but Riccardi’s two goals allowed the Seawolves to fight back and come home with a series split. Stony Brook returns to The Rinx next weekend to host the University of Delaware Blue Hens, a match-up that the Seawolves have not lost at home in over four years. The two-game set will be played Saturday, Oct. 28 at 8:30 p.m. and Sunday, Oct. 29 at 3:30 p.m. In a previous version of this story, The Statesman reported that game took place at the Rinx in Haupaggue, New York. It was played at Bird Arena in Athens, Ohio.